Why do people lift weights day after day but not make much progress by way of muscle development? Why is it so hard to build muscle using exclusively calisthenic training? Why do people who lift low repetitions but high loads seem to get stronger but not as big as people doing moderate load bodybuilding style training? Why doesn’t 2 sets of 25 seem as effective for muscle growth as 5 sets of 10? Today we’re going to talk about a theory that helps explain all of these things while also providing you with an important framework when you’re trying to gain muscle with resistance training. This is a fairly well supported theory that implies you have to reach a certain level of fatigue and subsequent mechanical tension to properly induce muscle growth. You can build muscle using a variety of set/rep schemes, this models explains why. This means that 3 sets of 15 should be about as effective as 3 sets of 5 if hypertrophy is the objective. Research has largely shown that training to failure with high reps and training to failure with low reps yields similar results in hypertrophy. What’s the common theme then? Stimulating enough muscle via fatigue. Henneman’s size principle tells us that muscle is activated in ascending size. It’s a key principle in the science of muscle hypertrophy. Smaller motor units start first and then bigger units kick in as you fatigue. In essence the same large amounts of muscle will be engaged whether you lift 3 sets of 5 reps to a high level of fatigue or 3 sets of 15 reps to a high level of fatigue. Fatigue is what engages the most muscle into adaptation for size, regardless of the rep range. When you train to build muscle, your reps should noticeably slow at some point in the set. Not to a point of grinding reps out though, this will cause too much muscle damage and hinder recovery. The appropriate amount of fatigue in my experience is reaching technical failure. It maximizes the number of effective reps you’re capable of accumulating in any given set or workout. Without all the muscle damage and burnout associated with taking things to absolute failure. i.e. you do enough work to easily recover from in ~48 hours. It’s all but been shown to be a requirement of muscle building. A follow up article on reps in reserve may provide some further insight but there is a definitely an element to slowing reps that improves hypertrophy outcomes. For building muscle 3 sets of 5 should be as ‘effective’ as 3 sets of 15. Provided you’re training near your true repetition capacity around technical failure. The point where technique starts to change or feel a bit different. This provides a pretty good model as to what appears most effective for muscle hypertrophy. Why 5 Effective Reps a Set? Above you see 5 effective reps per set as a generalized recommendation. Could be 4, could be 6. This is just a rough guide. Anecdotally I can tell you that you don’t see much hypertrophy at less than 5 reps. This is likely because they don’t add additional sets to the same level of effective reps.
People will opt for 5 sets of 5 to get 25 effective reps. That in and of itself for multiple exercises takes a long time to get through. Rarely would you see 8 sets of 3 for 24 effective. It would simply take too long. Really high load, low repetition training also is not that appropriate for many useful isolation exercises where moderate to high loads are best. Five appears to be about the sweet spot. It is not an absolute number. No one is doing 5 sets of 3 for the rotator cuff or calves, it just wouldn’t be that appropriate. Sets of 5–6 is usually the lowest number of reps you’ll see for isolation exercises for this reason. More often 8–12 reps.
Of course training below 5 reps near technical failure is also really rough. If you want to build strength you want to be fresh, not fatigued. For strength you likely want to stop a rep or two shy of technical failure. The biggest potential problem with anything lower than 5 repetitions for muscle gain purposes is accumulating enough effective reps in a reasonable time frame. It would take 5 sets of 3 to accumulate the same effective volume as 3 sets of 5. Accounting for the necessary rest intervals and the 2 extra sets, it could take 66% more time to get 5 sets of 3 done. Obviously if you have to do that for several exercises then it can take quite a large amount of time to get through any given workout. There is an upper limit to how much time most people can spend training. Also a point of diminishing returns for that time spent. Doing four exercises of 5 sets of 3 will likely be pretty counterproductive at some point. Even if you were using a 2x2 training framework approach. It’s true you will likely get stronger doing 5 sets of 3 but you don’t get a better payoff for muscle hypertrophy than the faster 3 sets of 5. Choose your battles. On the flip side, if you’re doing lots of high repetition work, which I would classify generally as >12 reps or maybe >15 reps. You have a lot of ineffective reps increasing your time investment. 3 sets of 20 takes 100% longer to get through than 3 sets of 10. That isn’t to say that 3 sets of 10 is better, just that it requires less time investment. Note: There are other good reasons to occasionally do sets of 15 (less joint stress, less load required, good for recovery purposes). Just as there are good reasons to occasionally do sets of 3 (more joint stress, improved strength outcomes, bone density, tendon development). It baffles me when I see hypertrophy programs with a ton of work over 12–15 reps. Again, choose your battles. If you want to improve fatigue resistance and increase muscular endurance go for it. If you want to build muscle, keep it under 15 reps most of the time. This is a problem for folks trying to use calisthenics exclusively for muscle gain purposes. As many men quickly get to 20, 30, 40 repetitions with a pushup before they hit stimulating or effective rep territory. So the time investment required increases here too. With a lot of calisthenics training you hit a threshold of development faster because once you drop below 40% 1RM (about 20–25RM or your repetition capacity to do 20–25 reps) you see less and less hypertrophy. Many common bodyweight exercises that people try to use on their own at home do not create enough of a stressor. Particularly once they drop below 40% 1RM. 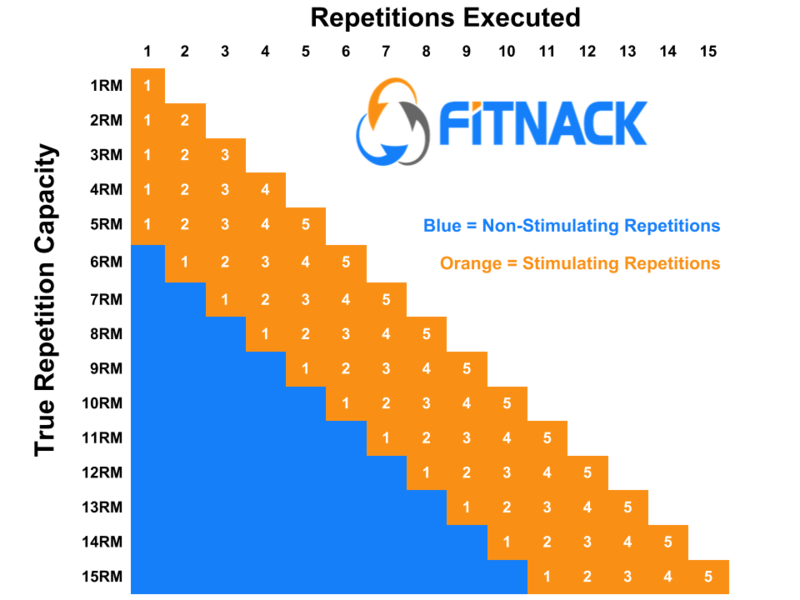 Add to that my theory that the higher and higher the reps the more the need for absolute failure (having to stop completely) and you’ve doubled the difficulty. Most people will struggle to push themselves that close to absolute failure when the sets are so long. It’s harder than it needs to be. Read more about Absolute Failure and watch the video here. Don’t get me wrong, I love calisthenic exercises. They are excellent for warming up, coordination, keeping people fresh and occasionally maxing out. I also know how to advance them better than most. I field a lot of questions from young men trying to build muscle with mainly pushups or calisthenics. My answer is always the same. They will work until a point but they have a steeper learning curve. You need to find ways to progress them and keep the reps down. Meaning prevent the reps from getting too high and taking too much time to reach the effective reps. Usually this means purchasing or having access to pieces of equipment like bars, bands, something to increase the external load. I get it. Gyms can be annoying for some. Inconvenient for others. They cost money. It’s free to train with your bodyweight but a tremendous amount of people still end up disappointed. This is why. They spend all this time training a handful of calisthenics movements. They get good at them. They can do a ton of repetitions but they still aren’t seeing the results they’re chasing. It feels like they constantly have to do more (and they probably do). The answer is, not enough effective reps, too great a time investment. They are improving muscular endurance, not training for hypertrophy. Invest in some equipment at home if you want to go the calisthenics route. You can make it work but you will need to educate yourself a bit more than the average gym rat. You likely want to spread your work out over multiple sets to maximize the number of effective reps. 2x25 will likely only be 10 stimulating reps. 5x10 could be 25 effective reps. Same number of reps, big difference in the result. Generally speaking something between 5–12 reps (maybe 5–15) is where most of a person’s training should lie if muscle growth is the ultimate goal. It’s the range that requires the least amount of sets and overall repetitions to reach an appropriate number of effective repetitions. It requires the least amount of total time investment and thus the best bang for your buck. If you want to build muscle but like lifting heavy, you might want to skew more to the 6–8 rep range. If you like to feel more of a pump then you might want to skew higher to the 10–15 rep range. They will likely yield similar overall results but you may enjoy one or the other more or less. Of course you need an appropriate amount of volume but that might be directly related to volume where the concentric action of muscle (the lifting phase) is actively slowed. You’ll periodically want to mix in high low low rep training to improve strength and improve joint stress tolerance (bone mass/ligament/tendon development). *You may also want to mix in low to moderate repetition/load explosive actions for their bone and tendon development too. You’ll also want to periodically mix in some low load high rep training to give your body a bit of a break and improve fatigue resistance. Read “Is It Better to Lift Light Weight or Heavy Ones? ~70–80% of training time should be moderate load/moderate volume training if muscle hypertrophy is the main objective. You also have to make sure the sets last long enough and get close enough to fatigue to be effective. If you’re not getting the result you seek after months/years of training, this could be one explanation. Take it under advisement. Originally published at Skill Based Fitness. We teach fitness, nutrition and mindset skills that enhance quality of life. Next up, you Version 2.0.